Consider a particular representation, , of on that preserves a cube centered at the origin, with faces orthogonal to the axes. 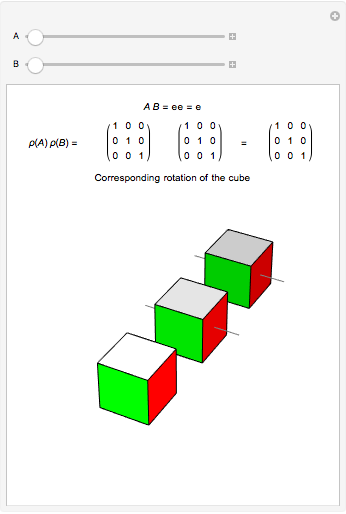 By examining the action of elements of the group on the cube, both singly and in composition with other elements, you can see that is isomorphic to the group of rotations of the cube. The brightest cube is fixed and the next two cubes show the actions of and . The axes of rotation are shown in gray. The thickest axis represents . The two sliders can be used to select elements and from . These elements are shown in cycle form, as is their composition, . Below that are the matrices of , , and . The graphic shows how these matrices act on a cube centered at the origin, with faces orthogonal to the axes. The brightest cube is fixed, and displayed only as a point of reference. The middle cube (slightly darker) shows the action of on the fixed cube, where the gray line shows the axis of rotation. The action of is first, since the operation throughout is composition. The third and darkest cube shows both the action of on the cube already acted on by and the action of on the fixed cube. The thinner gray line shows the axis of rotation of and the thicker gray line shows the the axis of rotation of the composition . By experimenting with different elements and compositions of elements, you can verify that is isomorphic to the group of rotations of the cube. Keith Schneider "The Group of Rotations of the Cube"